This article shows how to create a DMARC policy to use with Cloud Office. For more information about prerequisite terminology, see Cloud Office support terminology. 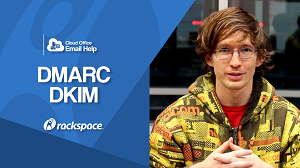 If you prefer a video tutorial, please see Rackspace Email - DMARC / DKIM: What It Is & How to Setup . DMARC enforces SPF and DKIM. DMARC is useful only if you have already set up SPF and DKIM records. Before creating your DMARC policy, you must first create an SPF record policy, then create a DKIM record, and lastly create a DMARC record policy. How should questionable mail be handled? Decide whether questionable email should be rejected outright or should be classified as a “soft fail,” which means that the email is further scrutinized or sent to spam. Who should receive DMARC reports? When the receiving host processes mail that comes from the domain, the host generates reports. These reports are sent to the email address specified in the DMARC policy. dmarc: identifies the TXT record as a DMARC policy. v=DMARC1 indicates the version of DMARC used. p=quarantine: is the policy action. rua= identifies the destination for the aggregate reports. pct=100 specifies how much traffic should be subject to policy validation. Note: If your DNS is not hosted with Rackspace, you need access to your DNS provider to add the DMARC policy. If you do not know where your DNS is hosted, see Find DNS host. Log in to the Cloud Office Control Panel. In the Domains section of the home page, click the DNS settings link. On the DNS Settings page, click the domain for which you want to add this record. Under the Advanced Settings section, select DNS records. Under Hosting Records, click on Add Additional Record. Your new settings take 24 to 48 hours to propagate. For more information on propagation, see DNS propagation. Your DMARC policy is more valuable when you use an aggregator to help filter the content of the reports that are returned. Without an aggregator, the reports are in an XML format and are virtually unreadable. An aggregator formats this information and sends out weekly reports to the email address specified. The weekly report contains the sending source (domain or IP address) and information about whether the message passed or failed SPF and DKIM. This information enables you to monitor your domain’s activity and helps to prevent spoofing and domain abuse.